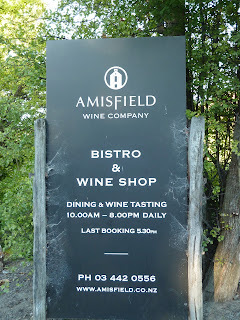 After a day of retail therapy, we headed to the Amisfield Wine Company's Bistro for a 5 course Chef's Tasting Menu. 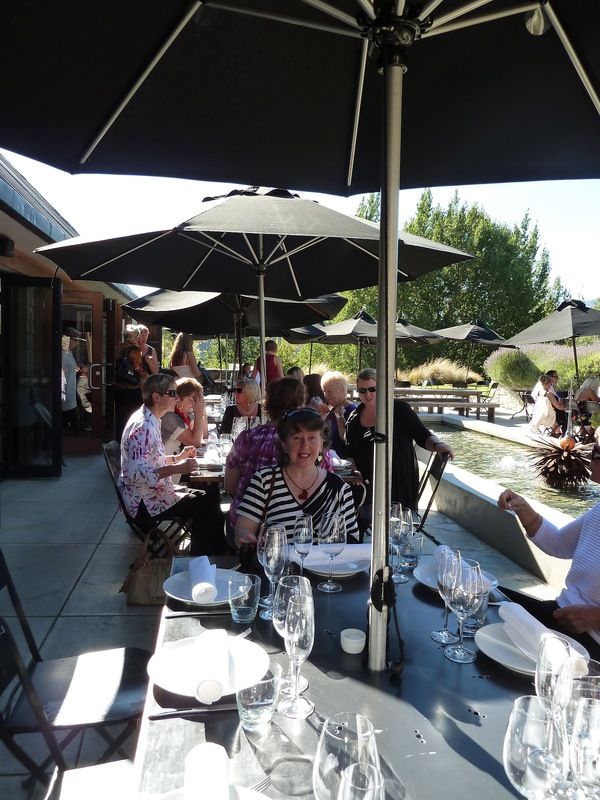 The winery is located in the Lake Hayes area and as we arrived, the sun was still shining very brightly so we tried to stay under the large umbrellas as much as possible. 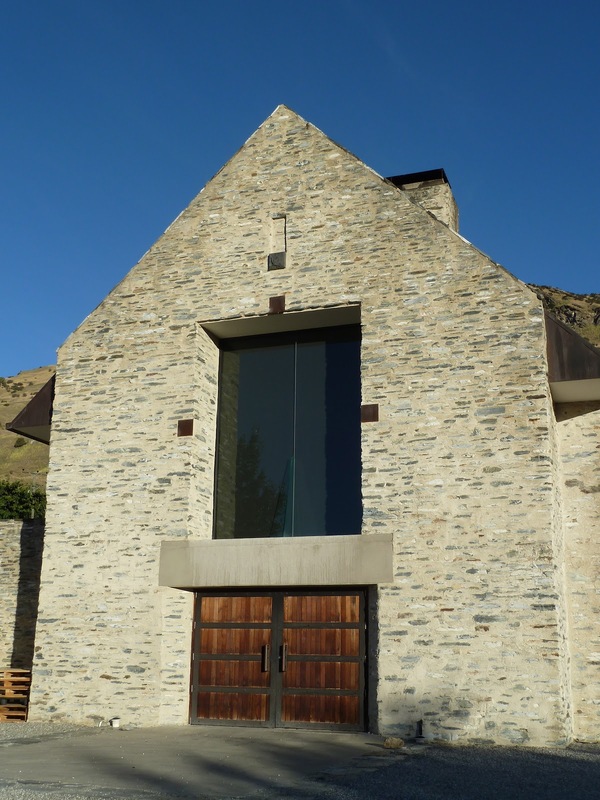 One thing I have learnt since arriving in Queenstown is that in the summer the sun sets quite late in the day, around 8.30 to 9.00 pm and between 3.00 to 6.00 pm is the hottest part of the day. Since we have been here, we have been having 30 degree days and the heat is dry heat. Humidity is extremely low, almost non existent. The dining area for the bistro is located in a lovely garden surround and as the evening wore on, it just felt lovely to be sitting outside on such a balmy evening enjoying a good meal with some lovely ladies. Oops, I just realised that I used the word 'lovely' three times in the one sentence. Oh well, it's not perfect English and I want to emphasise how I feel about my experience! 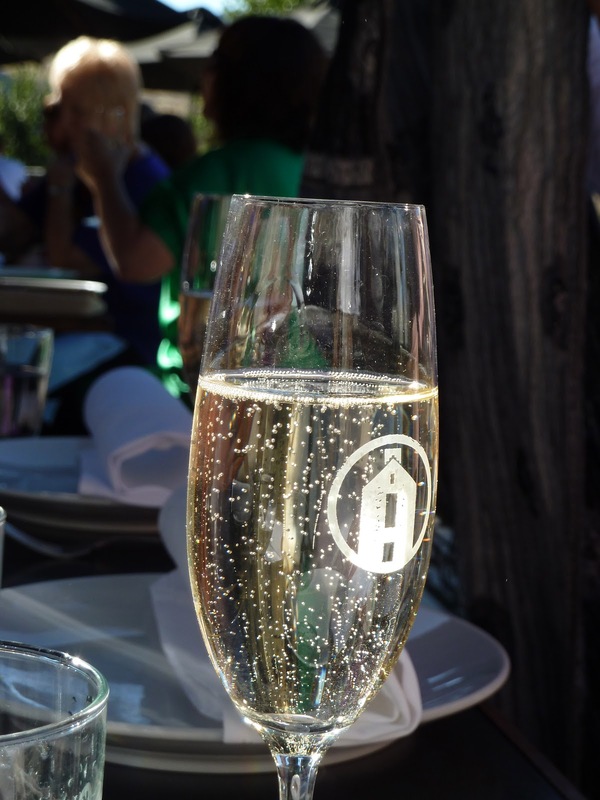 Each of the course was matched with a wine from the winery. As each course was served, the head chef Jay Sherwood came around to each table to check on how the meal was progressing. From a distance Jay looked like he hailed from Europe but it turns out he is a true blue Californian. Course 1 - served with Amisfield Arcadia Brut NV. It was salted cod mixed with garlic, olive oil, lemon zest, fresh parsley, and potatoes, served with house made toasted sourdough bread. Verdict: I am normally not into cod, per se. But I found the cod flavour quite subtle and not overwhelming and I did enjoy the entree. The Brut complemented the dish quite well. Course 2 - served with the Amisfield Arcadia Brut NV. It was Prawn risotto with sun dried tomatoes and parmesan cheese, with a touch a pinot gris in the risotto.The prawns were marinated in lemon zest and olive oil. Verdict: Loved the risotto, it was creamy and had a slight bite to the rice (which I do like) and the prawns worked beautifully. Everyone at our table thoroughly enjoyed this dish! Course 3 - served with Amisfield 2011 Pinot Gris. It was Hot smoked salmon with fennel, capers and dill with cream cheese. Verdict: The salmon tasted of summer. It was lightly smoked, and went beautifully with the fennel and capers. The Pinot Gris was a good choice with the salmon. Jo, who was not keen on salmon, was served grilled haloumi with rocket salad. We also had some nicely roasted potatoes. They look good, don't they? Course 4 - served with Amisfield 2009 Pinot Noir. It was Slow roasted Merino lamb shoulder served with a salad of lettuce tossed with a touch of honey dressing. The lamb was cooked with garlic, rosemary and pinot noir for 4 hours. Verdict: If you read my post on dinner at Wakatipu Grill, you would have read how I described the slow cooked lamb dish of that night. Well guess what? This one is even more tender and even more fall of the fork, melt in your mouth tender! I don't know how they did it, but the lamb was fabulous! It was another hit at our table. Another thing that I noted was how passionate the chefs are in emphasising on using local produce and knowing the areas where the produce come from. For example, the lamb we had for 2 nights in a row was Merino lamb. Why Merino lamb? Because the Merinos are located in the mountain ranges, they do a lot of climbing up and down the ranges and as result have more muscle and less fat. The meat is leaner (i.e. less fatty and rich) than other types of lamb available. Course 5 - served with Amisfield Noble Sauvignon Blanc. There were 3 types of desserts served; Chocolate almond torte with vanilla bean ice cream and toasted hazelnuts. The 2nd dessert option was Vanilla bean pannacotta with cherries and the 3rd option was Meringue with lemon cream and cherries. Verdict: All the desserts were a hit. I was already so full by then, I couldn't bring myself to finish the chocolate torte but I completely finished every bit of the vanilla bean ice cream. 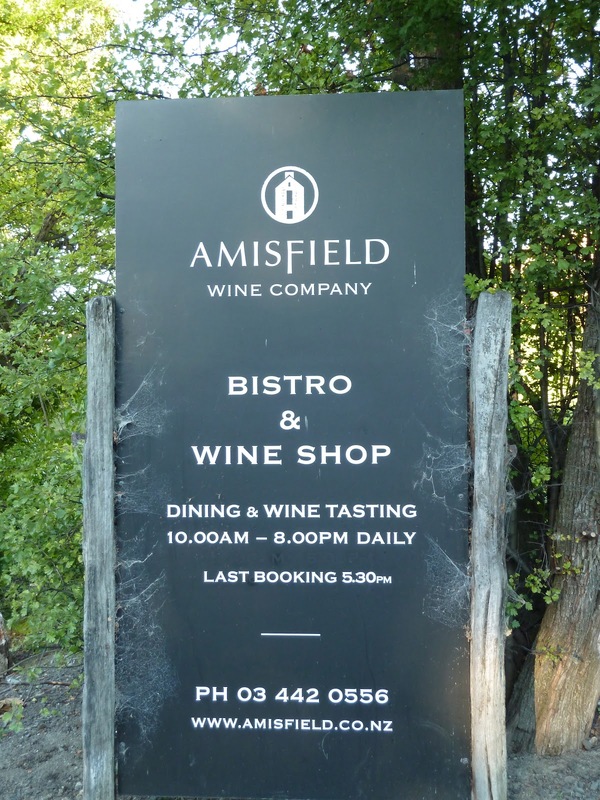 The service was wonderful and we really appreciated the effort the kitchen team had put into every dish. An absolutely enjoyable evening! Thank you Jay and the whole team for a memorable experience.